Amazon has a list of products called "Movers and Shakers," which is pretty much fancy talk for things that are ~trending~. 1. A 12-pack of cacao Soylent that'll change the meaning of, "I need a drink." Each 400-calorie bottle is vegan and includes isolated protein from soy, slow-burning carbs from beets, and essential vitamins and minerals. 2. A dystopian cult classic for people who wanna live in a world where TRON meets Trailer Park Boys and the '80s never end. 3. An egg cooker, so you can stop being such a chicken and egg-noring us when we say making these won't be ~hard~ at all! This egg cooker includes a recipe book, poaching tray, measuring cup, omelette tray, an egg tray (holds up to six eggs), and it's dishwasher-safe. It also automatically shuts off when eggs are finished cooking, so there's no risk of messing up! Thank you, kitchen gods. 4. An off-the-shoulder swimsuit to wear on your next spontaneous vacation (get ready to tell your boss, "sea ya later!"). 5. A felt headphone headband your child is gonna love as much as you love them... when they're silently watching Paw Patrol on your nine hour flight to Hawaii. 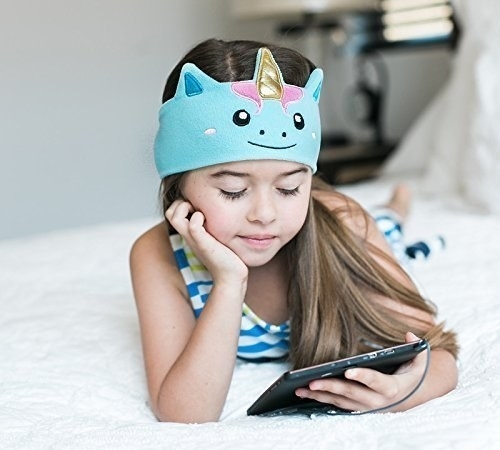 These cute headbands are washable and come with a durable braided cable. They are designed with ultra-thin speakers that are limited to 90 dB to protect your kiddo's ears. It can also be pulled down over the eyes and used as a sleep mask (this thing really is a lifesaver for parents traveling with littles). 6. A pack of caffeinated gum that'll help keep your brain awake through the rest of the rose ceremonies in The Bachelor. Comes in a pack of six boxes, that's 54 pieces of edible energy! 7. A beard kit for your furry valentine. This set comes in a luxury gift box and includes a conditioning jojoba beard oil, organic beard balm, boar bristle brush, styling comb, shears, and a cotton carrying case. 8. An Echo Spot that can control your sprinkler system, update you on weather forecasts, walk you through recipes... basically it can be your new mom (bye, Mom). The Echo Spot connects to Alexa and has a second generation far-field voice recognition that'll let you watch video flash briefings, see music lyrics, weather forecasts, and to-do/shopping lists. It'll let you browse and listen to Audible audiobooks, music, and more. The Echo Spot has a built-in speaker system, using BlueTooth connection you can play music in multiple rooms throughout your home. With Alexa your Echo Spot can turn on your lights, show baby monitors and front door cameras, lock your doors, control your thermostats, garage doors, sprinklers, and more. 9. A natural seagrass belly basket — it's gonna smell amazing and make your storage look seriously chic. 10. A pack of eight FreshPaper sheets to keep your produce alive until you finally convince yourself to start eating broccoli. These things are basically dryer sheets for produce. They're made from edible organic spices that reduce spoilage and keep your produce fresh up to four times longer than average. Throw one in your fridge or countertop and watch your food live a long and healthy life! 11. A braided nylon charging cord your cats and kids can gnaw on all day without causing a frayed wire or tear (although we're gonna go ahead and recommend NOT eating it). 12. A cereal dispenser that'll trick people into thinking you've upped your grown-up kitchen decor, when really you're now pouring Cheerios straight into your mouth when running out the door before work. 13. A box of 48 thank you cards that are gonna come in handy whenever you wanna say "thanks" without actually having a social interaction (remind me how to "eye contact?"). This box of 48 postcard-style thank you cards comes with 48 envelopes and stickers. 14. An at-home waxing kit so you can lose hair as fast as Kim and Kanye lost their fanbase in Chicago. This electronic waxing kit comes with four bags of hard wax beans and is suitable for most wax types. The kit also includes a warming dish, wooden applicator sticks, and is made of nonflammable material. With an adjustable temperature available, the wax warmer has an eight minute melt time for your quick waxing fix! 15. A pair of slip-on boots for people who know getting on regular boots is another way winter punishes us for loving summer more. 16. An air plant kit which, with the plants' resilience and versatility, may make your studio apartment look like a seriously gorgeous garden (step aside, Versailles, we've got air plants on the PlayStation). Includes 11 unique plants and a bottle of air plant fertilizer. 17. A microfiber mop that'll make your floors glisten like the day your boyfriend dropped an entire bottle of olive oil on the kitchen floor (he def stayed extra virgin that night). This professional-grade microfiber mop includes two microfiber wet mop pads, a microfiber dust mop pad, an adjustable stainless-steel mop handle, and a heavy-duty aluminum mop frame. It can clean hardwood, laminate, tile, stone, and concrete floors, and it comes with two free premium microfiber cloths. 18. A BLOM headband and styling book to seriously improve on your messy-bun look while letting you get away with bedhead for the rest of your days. 19. A cute and genuinely practical dome umbrella to let you see clearly while you look for the perfect person to kiss in the rain. 20. A waterproof speaker that's gonna make your shower concerts (and solo singalong hikes) something special. This genius device is shockproof and waterproof, and comes with an aluminum alloy hook. The case has a built-in Bluetooth speaker that'll play crisp, clear music. You can also connect it to your iPhone for hands-free calls wherever you are. The built-in rechargeable battery can play for up to six hours, which is plenty of time to perform Hamilton in its entirety while you shower. 21. A stainless-steel compost bin that'll help you get the most from your compost. This scratch-proof compost bin uses built-in charcoal to eliminate odors, allowing you to actually keep your kitchen scraps in the kitchen. This, along with its sealed design, prevents house flies and pests from being attracted to it. Hand wash with dishwashing soap. 22. And a 12-inch green tea memory foam mattress so comfortable you're gonna fall asleep before you can even enjoy it. This memory foam mattress is Infused with green tea extract and castor natural seed oil to naturally prevent odor and bacteria. The design relieves pressure for a form-fitting and comfortable night's sleep using a three-inch memory foam, two-inch comfort foam, with an airflow high density foam, and an airflow high density base support foam. Promising Review: "Ho. Lee. Crap. I never thought a mattress could be this great. The first time I tried it out, I wasn’t optimistic. It didn’t seem like it could be enough. Imagine my surprise when I laid down to test it out and fell asleep immediately. If you're looking for a memory foam mattress, don’t pay $2000. Buy this." —Courtney G.
When your Amazon package arrives a day early.